By the 1890s, the Eastern Shoshone Tribe had been living on its reservation in the Wind River Valley for more than two decades, under its treaty with U.S. government. The Northern Arapaho, in a supposedly temporary arrangement, had been living there more than a decade. With the buffalo long gone, government food rations uncertain and measles, diphtheria and other diseases on the rise, the tribes came under steadily increasing pressure to start selling off reservation lands. The Eastern Shoshone had signed a treaty with the government in 1863 that allocated to the tribe an area on both sides of the Continental Divide of around 40 million acres. Just five years later, the tribe signed a treaty establishing a new reservation in the Warm Valley of Wind River—of just 3.2 million acres. Four years after that, they signed away the southern third or so of the new reservation under pressure from the U.S. and Wyoming territorial governments, representing the interests of gold miners around South Pass and the merchants and farmers of the new town of Lander, which had sprung up to serve the miners’ needs. In 1878, the U.S. Army escorted the Northern Arapaho—950 or so people—to the Wind River Valley. The government had promised the tribe a reservation of their own—but at a location to be named later—in a treaty signed at Fort Laramie in 1868. No reservation had materialized. Buffeted by wars and the dwindling buffalo economy the Arapaho were nearly destitute when they arrived on Wind River. By 1885, the buffalo had disappeared entirely from the Wind River valley and, but for a few hundred head, entirely from the West. Due in part to graft, the food rations and other supplies that both tribes drew at the Shoshone Agency, according to their treaty agreements, continued to dwindle. Shoshone and Arapaho alike, Capt. William Quinton wrote to the Secretary of War in 1889, were in “a state of semi-starvation.” Individuals by then were receiving about a pound of beef and 10 ounces of flour per week. By 1890, those amounts were down to 14 ounces of beef and eight ounces of flour. In 1887, Congress passed the Dawes General Allotment Act , setting up a framework for dividing up tribal lands on reservations into plots to be held by individual Indian owners, after which they could be leased or sold to anyone. Critics saw it as a method clearly intended to transfer lands out of Indian hands. Many Northern Arapaho men had gone to war in the mid 1870s as scouts for General George Crook in his campaigns against the Lakota Sioux. A decade later, they still saw Crook as a friend and ally, and clung to the hope that he would find them a reservation, perhaps on Tongue River in northern Wyoming and southern Montana territories. They also knew Shoshone Chief Washakie was pressing government officials to move them away from Wind River. After Crook died unexpectedly in 1890, both tribes were more willing to bend to government pressure to begin selling off reservation lands. In 1891, both tribes met with a three-member government commission to begin negotiations. Arapaho leaders saw land sales as a way to obtain money and services, as well as government recognition that they had a right to be located where they were. Shoshone leaders directly challenged the Arapaho right even to be at the meeting, let alone to be living in the valley. Both tribes were now entering extremely difficult times. Weak from malnutrition, plagued by bad sanitation practices resulting partly from their newly sedentary lives, they fell victim to diphtheria, influenza and measles. The Eastern Shoshone population, according to agency figures, fell from 1,250 in 1885 to 841 in 1900—a loss of a full 32 percent in just a decade and a half. Northern Arapaho numbers fell from 978 to 801 over the same time—a 14.6 percent decrease. Measles killed 152 people in 1897 alone. 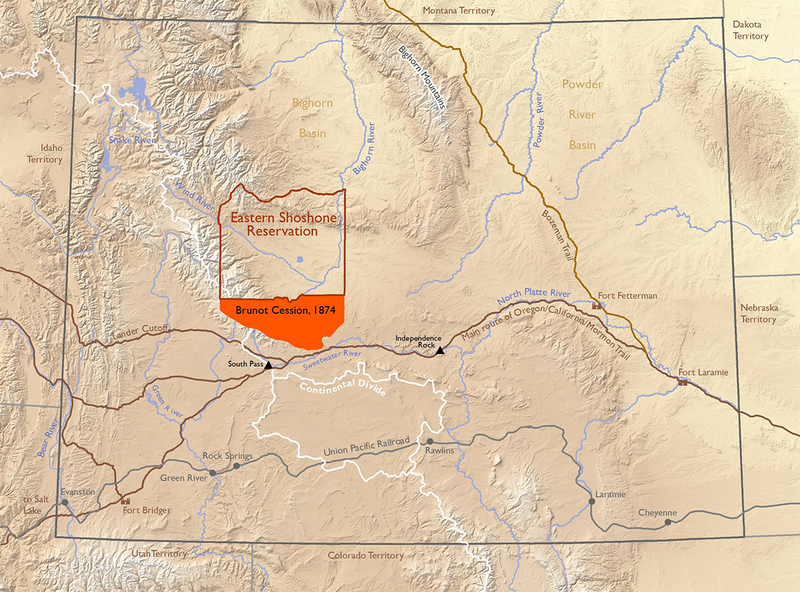 At the 1891 meetings, both tribes agreed to sell 1.2 million acres of reservation land north and east of the Big Wind River, which would leave them 900,000 acres. The tribes managed to deflect a move by the government commission chairman, John Woodruff, a local rancher and merchant, to include in the sale a strip of well-watered land on the south side of the river between Mill Creek and the North Fork of the Popo Agie. Money from the entire sale was to pay for schools and cattle herds for the tribal people, with the rest to be placed in interest-bearing accounts. Persuaded perhaps by Woodruff’s complaints about not getting the land he wanted, however, Congress refused to ratify the agreement. Indian Bureau officials tried again two years later, pushing for an even larger sale of 1.6 million acres, including the strip Woodruff had wanted earlier. Although the food shortages worsened each year and deadlines loomed at the end of the century when, under the 1868 treaties, government food rations would disappear entirely, both tribes nevertheless refused the deal. By the mid-1890s, local whites had begun to covet the magnificent hot springs just north and downstream from the mouth of Wind River Canyon—site of present Thermopolis, Wyo., then the northeast corner of the reservation. The springs were producing 19 million gallons a day of hot water. Some white entrepreneurs already had dug ditches to bring the flow to “tent-walled spas with names like Hotel de Sagebrush,” historian Geoffrey O’Gara writes. They wanted to develop a resort, but to do that they would need title to the land. By then, that country north of Wind River Canyon and the Owl Creek Range had little value to the tribes as its buffalo herds were long gone. James McLaughlin, veteran government negotiator with Indian tribes around the West, began talks with Shoshone and Arapaho leaders. McLaughlin offered $50,000 for 10 square miles—64,000 acres of land. Both tribes were now only two years from the end of their annual food-ration payments under the 1868 treaties. Chief Washakie and the Eastern Shoshone wanted cash; Chief Sharp Nose and the Northern Arapaho wanted cattle and rations. McLaughlin upped the offer to $60,000. On April 21, 1896, of the 457 men in both tribes over the age of 18, 180 Shoshones and 93 Arapahos agreed to sign—just under 60 percent of the adult male population. As part of the settlement of this agreement, there were to be up-front payments in cash and cattle, with the rest to come in five annual installments. Rations were to be extended five more years. But the later payments “were not forthcoming,” according to historian Loretta Fowler. And Washakie added a single condition to the sale—that people always be allowed to bathe there for free. That agreement later became part of the transfer of the land at the hot springs from the U.S. government to the State of Wyoming. Today, free swimming is available year round at the small state bath house at Hot Springs State Park in Thermopolis. Swimming for a fee is available at two larger commercial pools. Equally important, the sale itself gave the presence of the Northern Arapaho tribe on Wind River an unofficial but semi-permanent status it had not enjoyed before—a status that still had no legal basis. The 1868 Treaty of Fort Bridger had guaranteed the Eastern Shoshone, together with “such other friendly tribes or individual Indians as … they may be willing, with the consent of the United States, to admit amongst them” exclusive rights to live on the reservation lands. Now the government, out of a need for expediency, was dealing with both tribes as equal partners. Eventually, three decades later, the question would be sorted out by the U.S. Supreme Court. The decision, which required that the government compensate the Eastern Shoshone for allowing the Northern Arapaho to reside on reservation lands, was rendered in 1937. Congress approved the settlement in 1939. Editors’ Note: This and other 2018 and 2019 articles and digital toolkits on the history of tribal people in Wyoming are possible with support from the Wyoming Cultural Trust Fund, the Wyoming Council for the Humanities and several Wyoming school districts, including districts headquartered in Fort Washakie, Arapahoe, Shoshoni, Lander, Cody, Laramie, Douglas and Afton, Wyoming. WyoHistory.org extends its thanks to all. “1896 Big Horn Hot Springs Land Cession Agreement…” Jackson Hole Historical Society and Museum. Accessed Dec. 8, 2017, http://jacksonholehistory.org/wp-content/uploads/1896-cession.pdf. Fowler, Loretta. Arapaho Politics, 1851-1978: Symbols in Crises of Authority. Lincoln, Neb. : University of Nebraska Press, 1982. An excellent ethnohistory of the Northern Arapaho people, with emphasis on their constantly evolving leadership and governance structures over time. O’Gara, Geoffrey. What You See in Clear Water: Life on the Wind River Reservation. New York: Alfred A. Knopf, 2000. 8-25; 269-272. Rea, Tom. “Peace, War, Land and a Funeral: The Fort Laramie Treaty of 1868.” WyoHistory.org. Accessed Dec. 8, 2017 at https://www.wyohistory.org/encyclopedia/peace-war-land-and-funeral-fort-laramie-treaty-1868. Article takes the funeral of Mni-Akuwin, Spotted Tail’s daughter, as a place to begin telling the story of Lakota-white relationships surrounding the1868 Fort Laramie Treaty. Stamm, Henry E. IV. People of the Wind River: The Eastern Shoshones, 1825-1900. Norman, Okla.: University of Oklahoma Press, 1999. A useful, reliable source on the Eastern Shoshones of the 19th century, with emphasis too on their relations with their white and Arapaho neighbors. “Treaty with the Eastern Band Shoshoni and Bannock, 1868.”Indian Affairs: Laws and Treaties. Vol. II, Treaties, pp. 1020-1024. Kappler, Charles J., editor and compiler. Washington: Government Printing Office, 1904. Accessed Dec. 8, 2017, at http://dc.library.okstate.edu/digital/collection/kapplers/id/20698/rec/1. Text of the 1868 Fort Bridger Treaty with the Eastern Shoshone and Bannock tribes. “Treaty with the Shoshonee and Bannacks, July 3, 1868.” Posted on the Jackson Hole Historical Society and Museum’s website about the Wind River Reservation. Accessed Dec. 8, 2017 a http://jacksonholehistory.org/wp-content/uploads/1868-treaty.pdf. A more readable pdf version than the Kappler text, with added comment by historian Henry Stamm. “Treaty with the Sioux, Brule, Oglala, Miniconjou, Yanktonai, Hunkpapa, Blackfeet, Cuthead, Two Kettle, Sans Arcs, and Santee, and Arapaho, 1868.”Indian Affairs: Laws and Treaties. Vol. II, Treaties, pp. 1003-1006. Kappler, Charles J., editor and compiler. Washington: Government Printing Office, 1904. Accessed Dec. 8, 2017, at http://dc.library.okstate.edu/digital/collection/kapplers/id/20643. Text of the 1868 Fort Laramie Treaty. Utley, Robert M. The Indian Frontier of the American West, 1846-1890. Albuquerque: University of New Mexico Press, 2003. Excellent source for the conflicts and treaties of the western plains in the second half of the 19th century, with valuable insights into the national politics and ideas of reform that informed the presidency, the Indian Bureau and the Army in their dealings with tribes. “Wind River Treaty Documents. Treaties and Agreements Between the Eastern Shoshones and the United States.” Jackson Hole Historical Society and Museum website on the Wind River Reservation. Includes commentary about and links to full texts of the Fort Bridger treaties of 1863 and 1868, plus the 1872 Brunot cession, the 1896 Big Horn Hot Springs cession and the Land cession of 1904. Accessed Dec. 12, 2017, at http://jacksonholehistory.org/wind-river-treaty-documents/. WyoHistory.org. “Coming to Wind River: the Eastern Shoshone Treaties of 1863 and 1868,” accessed Nov. 23, 2018 at https://www.wyohistory.org/encyclopedia/coming-wind-river-eastern-shoshone-treaties-1863-and-1868. _____________. “The Arapaho Arrive: Two Nations on One Reservation.” Accessed Nov. 23, 2018 at https://www.wyohistory.org/encyclopedia/arapaho-arrive-two-nations-one-reservation. Shoshone boundaries described in the Fort Bridger Treaty of 1863: https://www.wyohistory.org/sites/default/files/shoshonemapnew_0.jpg. 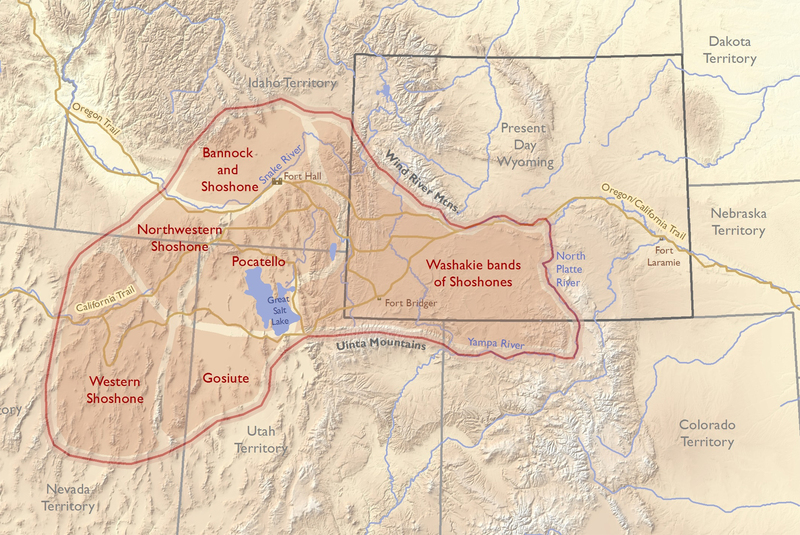 Shoshone boundaries described in the Fort Bridger Treaty of 1868: https://www.wyohistory.org/sites/default/files/twotreaties7.jpg. Brunot Cession of the Shoshone Reservation, negotiated 1872, ratified 1874: https://www.wyohistory.org/sites/default/files/arapaho4.jpg. “Father De Smet’s Map: Tribal Boundaries and the Fort Laramie Treaty of 1851.” WyoHistory.org, Digital Toolkit of Wyoming History. Accessed Dec. 12, 2017 at https://www.wyohistory.org/education/toolkit/father-de-smets-map-tribal-boundaries-and-fort-laramie-treaty-1851. See negotiator James McLaughlin’s 1896 report to the U.S. Senate, the text of the land-transfer agreement with the tribes, and Acting Indian Agent Capt. Richard H. Wilson’s later account of the signing and festivities surrounding it in Annals of Wyoming, Vol. 8 no. 2 (October 1930), pp. 529-545. Accessed Nov. 26, 2018 at https://archive.org/details/annalsofwyom8141932wyom/page/528. Download PDF here. The photo of Chief Washakie is from the Library of Congress. Used with thanks. The Matthew Brady photo of General George Crook and the photo of Indian agent James McLaughlin are from Wikipedia. Used with thanks. The photo of Sharp Nose is from the American Heritage Center at the University of Wyoming. Used with permission and thanks. The postcard of the state bath house at Thermopolis is from Wyoming Tales and Trails. Used with thanks. Henry Stamm IV, People of the Wind River: The Eastern Shoshones, 1825-1900(Norman, Okla.: University of Oklahoma Press, 1999), 238-243. Loretta Fowler, Arapaho Politics, 1851-1978: Symbols in Crises of Authority. (Lincoln, Neb. : University of Nebraska Press), 1982, 87-104; “A state of semi-starvation” and ration figures, 88. Fowler, 92. Stamm, 241-243; pressure to sell “tremendous,” 242. Geoffrey O’Gara, What You See in Clear Water: Life on the Wind River Reservation(New York: Knopf, 2000), 10. Fowler, 93; Jackson Hole Historical Society and Museum, “Reservation Politics, 1878-1900” in “An Introduction to the Wind River Reservation of Wyoming,” accessed Nov. 22, 2018 at https://jacksonholehistory.org/an-introduction-to-the-wind-river-indian-reservation-of-wyoming/. O’Gara, What You See in Clear Water, 21 for free swimming, 272 for the Wilson quote, for which O’Gara cites Annals of Wyomingvol. 8, no.2. See “For further reading and research” for the full citation. Eastern Shoshone and Northern Arapaho tribes approve sale of 64,000 acres including the hot springs at present Thermopolis, Wyo., for $60,000. The Wind River Indian Reservation is the primary site of most of John Roberts’s life and ministry. 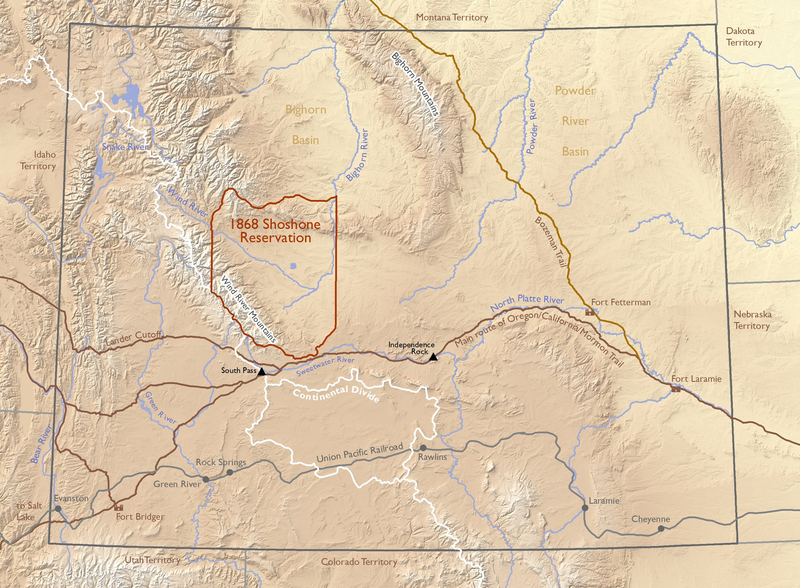 The reservation communities of Fort Washakie and Ethete are central to the story. Trout Creek Road, Fremont County 252, which turns southwest off US 287 at Fort Washakie, is the turnoff for the Roberts Mission and Sacagawea Cemetery. It is the continuation of the road from Ethete after it reaches U. S. 287. Hine’s Store, a gas station and convenience store, marks the junction. Travel west for about eight miles and you will come to the mission grounds located on the left. The historic Church of the Redeemer has been moved here, and the remains of the Shoshone Mission School for girls are also at this spot. Also located there is the Chapel of the Holy Saint’s John, which was the chapel for the school. The log building behind the chapel also served as the Roberts family residence. The mission grounds today also contain the present Episcopal Church, known as Saint David’s, and a parish hall. The outbuildings and the old orchard remain from the days of the mission. A historic marker is located on the site. This is the 160-acre plot donated by Chief Washakie. If the chapel is open, note the baptismal font located in the doorway that was dedicated to Washakie. There is no charge, and there is rarely anyone at the site. Church services are held on Sunday, and visitors are more than welcome to attend. Shortly after the turnoff to the mission on Trout Creek Road, there is a right hand turn. Take the turn and travel north to reach the Sacagawea Cemetery. It is on the left and can’t be missed. It is here that Sacagawea of Lewis and Clark fame is said to be buried. Her grave is prominently marked. This is the Shoshone tribe’s main burial ground and the graves speak for themselves. A recently dedicated statue honoring Sacagawea has been constructed on the north side of the cemetery. The old log structure off the parking area was once the original worship place for the Episcopal Church before John Roberts’s arrival. Visitors are welcome to visit the cemetery. When in the agency headquarters of Fort Washakie, you can travel west for about a mile until you reach the old military cemetery on the right side of the road. This is the burial place of Chief Washakie. Other Shoshones are buried there as well, but the U. S. Army graves have since been removed. The Wind River Agency headquarters are located in Fort Washakie proper. The final site to visit is in Ethete. Just south of the traffic light in the center of the community is Saint Michael’s Mission. The buildings are set out in a circle honoring Arapaho tradition. The post office is located in the circle as well as the “Our Father’s House” church. The church is a log structure with a picture window overlooking the Wind River Mountains. The Chapel of the Transfiguration in Jackson Hole was modeled after this building. Visitors are welcome at church services and may tour the building if there is anyone present. Wyoming Highway 20 winds for about 12 miles along the east side of the north-flowing Wind River through the Wind River Canyon's spectacular scenery. The Burlington Railroad follows the river on the west side. Highway and railroad both run through short tunnels through the hard rock from time to time. Wyoming highway department signs along the highway name the different geological formations exposed in the canyon walls, and give their ages in millions of years. Hot Springs State Park, in Thermopolis on the east side of the Bighorn River, offers a free campground, paved walking trails, a state bath house where bathers may soak for free, and two commercial bath houses, the Star Plunge and the Teepee Pools. For more information, on hours, directions, etc., visit the websites linked above.